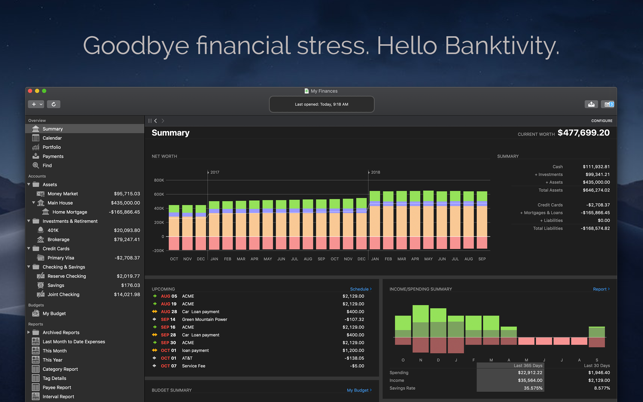 Goodbye financial stress, hello Banktivity! 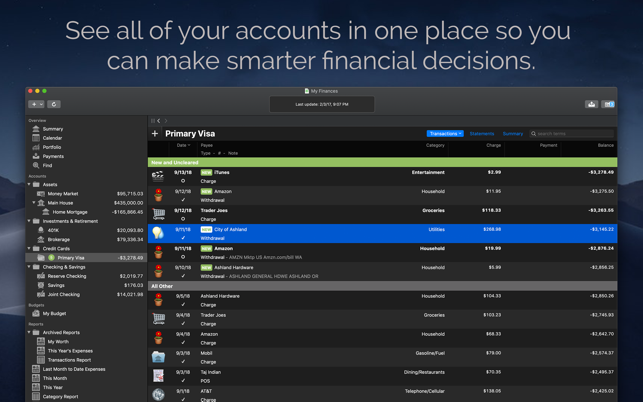 Banktivity lets you see all of your accounts in one place so you can make smarter financial decisions. 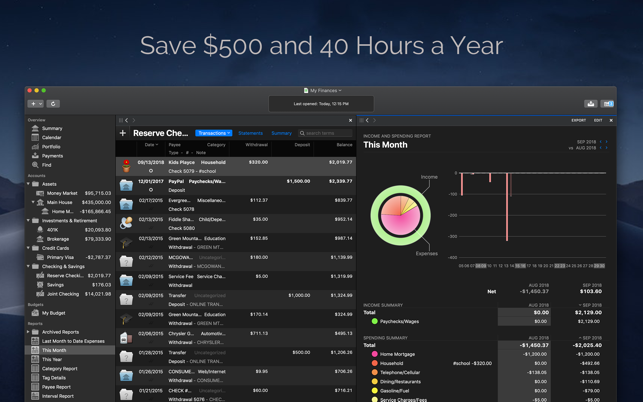 Ditch your old worn out finance software. Banktivity is the best – you deserve it, your finances deserve it! Exceptionally good technical support via live chat and email with US-based representatives. The first step in money management is to get all your finances in one place. If you’ve used software like Quicken (for Mac or PC), Banktivity's set-up assistant will import your old data. Next — or if you’re just starting out — download current transactions from your bank accounts online, at no cost, via direct connection to your bank or by using Banktivity's built-in browser to view your accounts and download your data for free. 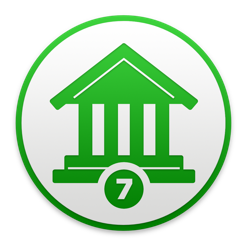 Banktivity's optional Direct Access* service makes this even easier by connecting to over 14,000 banks worldwide, automatically delivering the latest transaction data to your Mac. Banktivity has the tools you need to set up checking accounts, savings, credit cards, real estate, mortgages, investments and budgets. 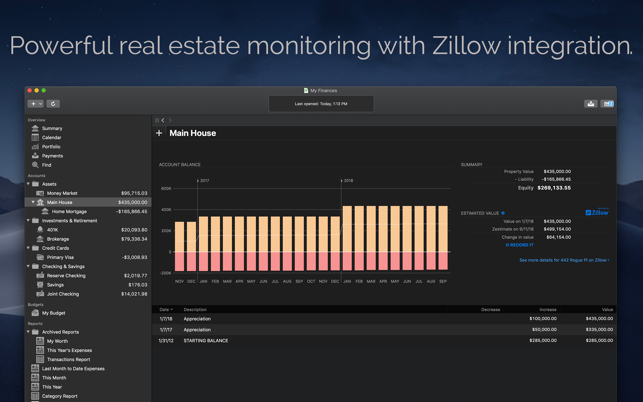 Then track each and every transaction: fine-tune them by categorizing, tagging, splitting or making custom edits — or let transaction templates do the work for you. Attach receipts or any file to transactions; reconcile to paper statements; search; track payments or transfers in any currency; and manage repeating events with scheduled transactions. Banktivity also lets you pay bills online! Set up payees, send checks, track their progress and see them appear in your register. You can print checks, too. Update your accounts at once with Banktivity's Update Everything button, syncing devices and fetching Direct Access data, securities prices even currency exchange rates. 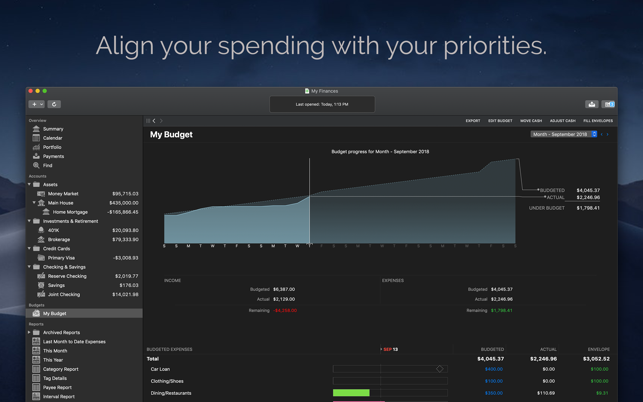 Banktivity's budgeting tools help you to set saving and spending goals, track expenses, cut debt and build a more secure future. By giving your available cash specific purposes, envelope budgeting lets you assign money to different categories and carry over savings. 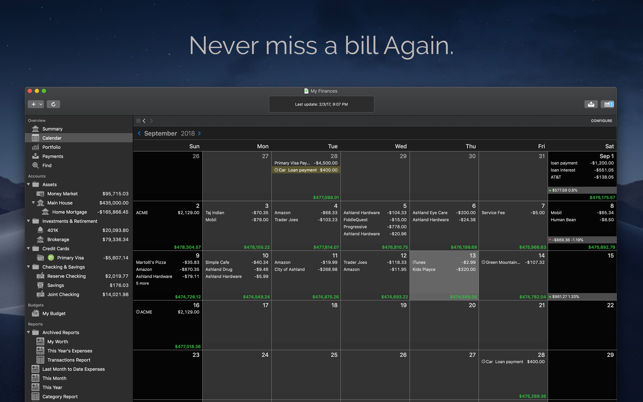 Banktivity automatically budgets scheduled transactions like paychecks and bills, so by categorizing each expense and editing the budget itself, you can see where your money goes — and how to make it go further! Banktivity does this visually so that you can see your daily progress; compare past, current or projected budgets; and view it all in a Budget vs. Actual report. Banktivity's investment features manage stocks, bonds, mutual funds, IRAs, 401Ks, CDs and other assets. 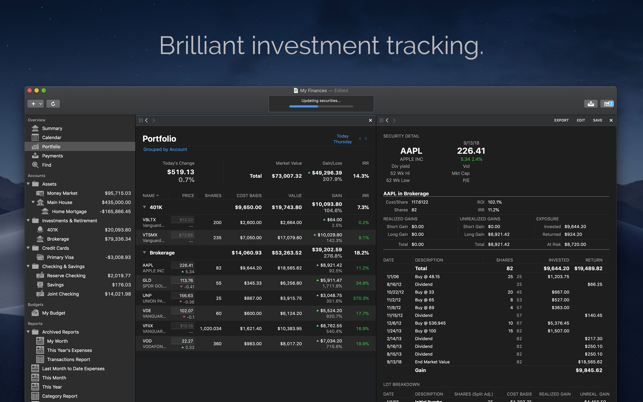 You can track buys, sells, splits, dividends, options and more. Banktivity calculates IRR, ROI and gains and losses. You can even pick which lots you've sold from. 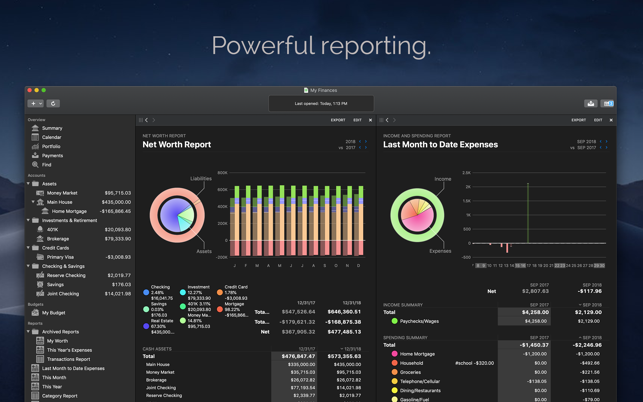 Built-in report templates (Income & Expense, Net Worth, Payee Summary and more) dynamically analyze your finances. Assign tax codes to transactions to generate a Tax Summary report (or export data to TurboTax); or view your holdings in the Portfolio or Investment Summary reports. Banktivity's reports instantly generate graphs and charts. You can drill down for detail with a click, export table data to spreadsheets, and print reports or save them as PDFs. No matter where you are, you can enter transactions on the go with Banktivity for iPhone (free on the App Store), or sync accounts, budgets and investments to Banktivity for iPad for mobile money management (iPad app sold separately). If you need help, get unlimited email support or Live Chat for answers quickly. Banktivity offers built-in Help files, plus a downloadable user manual, a searchable Knowledge Base and video tutorials at our site. *Direct Access subscriptions via In-App Purchase. Finally a usable replacement for Quicken! I tried this about 4 years ago when it was iBank and I found it lacking and I stuck it out with Quicken. My biggest issue with Quicken is that they don't like to communicate with PayPal - it will work for awhile - maybe a year or so then one side will change something and syncing won't work properly. Since 98% of my income comes in through PayPal - and many business expenses are paid through it - it is vital that I track it carefully. Quicken blames PayPal, PayPal blames Quicken and we get stuck in the middle. Banktivity lets me connect to PayPal either directly through the app, or by downloading Quicken QIF files (which Quicken for Mac cannot read!). I opted for the download as it gives me more detailed information. I have just converted everythigng over to Banktivity. It will cost me a little bit more than Quicken what with the $44/year Direct Connectivity subscripton, but that more than makes up for the numerous hours wasted each year trying to get PayPal and Quicken synced which proably ate up a couple thousand dollars of my time per year. There are some ergonimic quirks that are minor that keeps me from giving this five stars, but overall I am happy I can finally tell Quicken to kiss my derriere! First of all, let me say that I love the UI and logical layout of Banktivity. 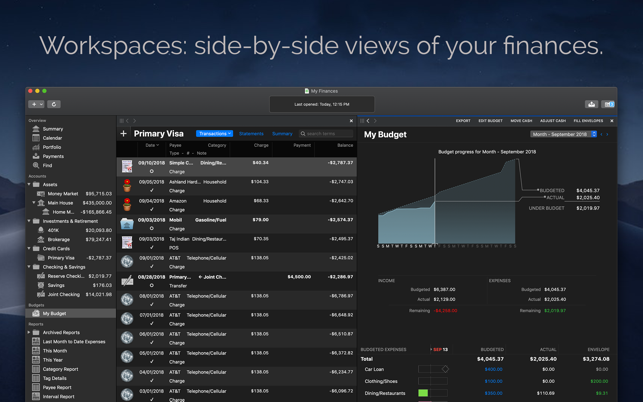 First-class and a welcome breath of fresh air after the slightly stale UI of MoneyWiz. And the Banktivity reporting features are flexible and actually useful. However, I miss one feature from MoneyWiz that I'm begging IGG to add. And that is the ability to refund transactions. And refund those transactions into another account if necessary. Study Case: You spend the night out with friends. While eating at a restaurant, you pay for the entire meal with your credit card and then your friends pay you back with cash. In MoneyWiz, you can enter the total bill on your credit card account, and then issue refunds off of that transaction. These refunds can be placed in any other account, ie your Wallet account because your friends paid with cash. This feature is so great because it keeps your credit card balance in MoneyWiz accurate, while also keeping your Wallet account accurate. And when you run a report, it doesn't look like you spent $100 for supper last night because MoneyWiz knows that most of that was refunded. Accurate account balances, accurate expense reporting, and a better financial picture without all the manual adjustments that I'm needing to make in Banktivity currently. 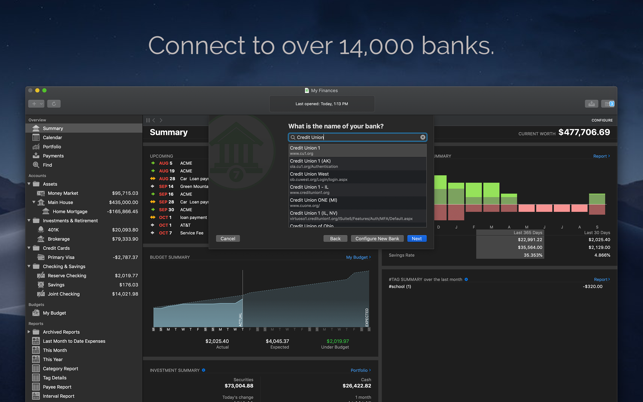 Please Banktivity developers, this would make my finance tracking much easier. Personally, it's perfect. Reading other reviews, there's a lot of complaints about crashing and hanging. I've never experienced this once. And I'm running it on an old MacBook Air. Not only is the app perfectly useable, it's gorgeous in it's dark mode display. As a new user, I converted my entire life over from Quicken and couldn't be happier. My 401(k) investment summary is reporting perfectly and all of the direct connections I have setup from my banks and credit unions are working perfectly. My only complaint would be the price but here I am approaching the end of my 30 day trial and am convincing myself that you sometimes have to pay for quality... that's why we'll pay a bit more for a beautiful laptop that'll last 7 years without a hiccup. This app and it's companion on my iPhone is going to become indispensible for me.